In the year 2013, cancer people would face immense difficulties in the first half of the year but the latter part of the year would be beneficial for them. You may also have confrontations with the people in authority. Due to the transit of Uranus, you may face some unexpected situations so its better to handle them wisely. You may also become aware of your hidden powers and talents. You should try to take a middle path instead of drastic steps. Also, your connection with the occult and spirituality may deepen this year. Those wishing to go abroad for higher education may face delays. 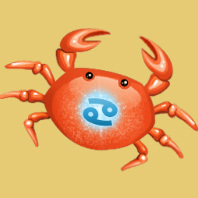 Cancer people desire of peace and tranquility in their home life and expect this from others too. Your domestic domain may remain relatively calm this year. Renovation, redecoration projects are possible. You may feel nostalgic and may also buy a home in the latter part of the year. Also, relationship with your parents, especially your father, may remain strained and your view of life may differ from theirs. Some guests at your place may end up extending their stay, and this may affect your domestic balance. Those of you who are single may find the love of their life this year. Also, you expect a lot from this relationship and would yearn for commitment, even if the other person isn't ready yet. Try not to act in haste. You should instead of getting angry, possessive or panicking get to communicate with your partner and discuss the issues. There are great chances of your love relationships culminating into marriage this year. Married couples too may look forward to enjoying a good time. Those of you wanting a child have a favorable time this year. You should take care of your health, eat well and rest well. Avoid over indulging in food or drink, as excesses of any kind are best to be avoided. Cancer females will need to take special care of their digestive and reproductive health. Besides this, barring a few seasonal ailments, cancer people can hope to have a illness free year. If you have already been suffering from some chronic ailments, try some alternative healing therapies to get enhanced and long lasting benefits. During first two quarters of the year, Cancer people may expect average to below average progress on the career and financial front. However, things would start to pick up from the third quarter onwards and by the end of the year you shall be quite satisfied with your progress and financial security. New doors are likely to open on the career front. Entrepreneurial endeavors' are favored by planets. Business expansion plans are also possible. Cash inflow will be good, but you should keep a tab on your expenses. Avoid speculation and stock market investments. Life is like a wheel of fortune, what goes up must come down and vice versa. You should always remember this valuable lesson, especially this year. You can take a break from work to reassess your priorities and try to rejuvenate yourself.